Chrontendo: At Length Did Cross an "Albatros"
At Length Did Cross an "Albatros"
Well, for once, the new episode is more or less, sorta, on time. Indeed, you can now go to archive.org and download or stream Chrontendo Episode 33. Considering that Episode 32 was such a monster, length-wise, I tried to keep things concise this time around - at least for games that weren't Bionic Commando. And we are back up to a full 15 games. That will get us all the way to the end of July, 1988, at least in Japan. As mentioned earlier, there are four pretty cool games that came out in July, which is definitely better than average. There is one that stands heads and tails above the rest, however, and that game is Capcom's Bionic Commando. 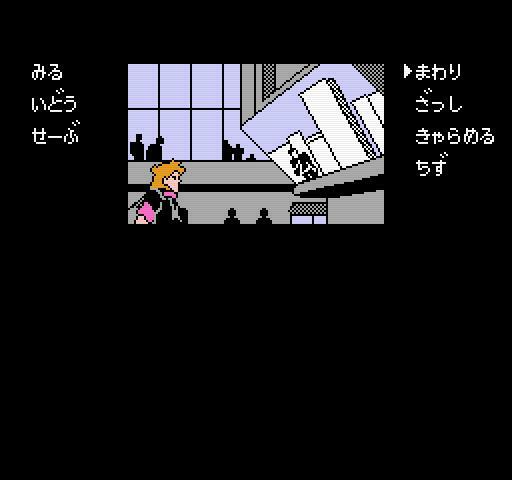 We see tons or virtually identical games on the Famicom - just look at all the boring sidescrolling walk-forward-and-kill-stuff games. We even have one this episode! But Capcom decided to come up with a pretty darned weird idea for BC - you control a heavily armed, cybernetically enhanced super soldier, who is unable to jump, at all. You can't even clear a gap a foot wide. This is never explained in the game itself, but the player will quickly learn to rely on the extensible grappling-hook/robot arm that Ladd Spencer comes equipped with. 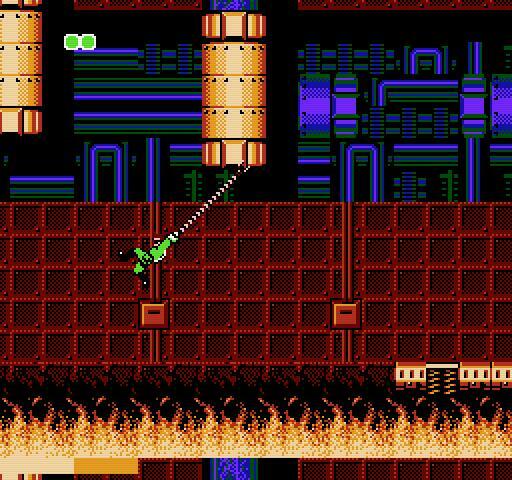 Thus you move from platform to platform by swinging through the air, Spiderman style. Of course there's a fire level! It should be mentioned, that Ladd (possibly a mistransliteration for Radd? "Radd" sounds so '80s!) is probably the most punk video game character we've seen so far, with his spiky red hair, shades, and Devo-esque green jumpsuit. Strangely, during cutscenes he transforms into a slightly more clean cut youth with natural brown hair. 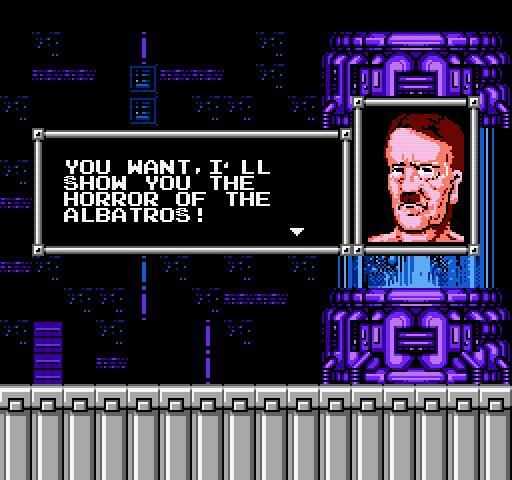 I think Der Führer might be overselling the "Albatros" a bit. 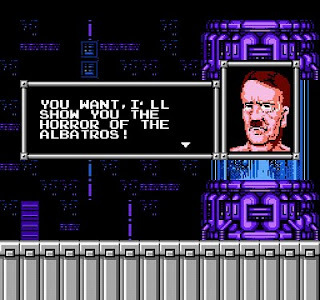 The plot, which gets doled out in bits of dialog with NPCs and Metal Gear-inspired radio conversations, goes like this: a neo-fascist military commander is planning to build a long-lost Nazi superweapon with the assistance of a revived Adolph Hitler. The superweapon, called "Albatros" (or, even better, "Abatros" in the manual), turns out to not be so amazing, as a rather large, exposed weak spot features prominently in its design. The most notorious moment in the game occurs when you kill Hitler: his face explodes into lovingly detailed chunks of gory meat. How this ever got past NOA is a bit of a mystery. All the references to Nazis and Hitler were removed for the US relesae, but the version seen in Episode 33 has hacked them back in. Putting your mascot into a sports game was hardly new when Technos released Super Dodge Ball to arcades in 1987. Nintendo had been doing it since day one, and even Sega quickly banged out an Alex Kid BMX game. But unlike those games, Super Dodge Ball has real character -- it's not simply another generic sports game. The gang violence of Renegade has simply been transported to the dodge ball court. Kunio now beats people to death using a rubber ball in place of his fists, which only the adds to his victims' indignity. Konami has certainly been shoveling a lot of sports titles onto the FDS and NES, but Blades of Steel is one of the few to truly stand out. Perhaps even more fun that Double Dribble, BOS has Konami showing off its full technical prowess in the service of a sports game. Speech synthesis, tons of onscreen sprites, and dead-on controls make this one of the best 8-bits sports games ever. Rainbows in space? I'm not sure that's even possible. Bubble Bobble was pretty darned good, but this purported sequel is even better. The simple black backgrounds of BB have been replaced with crazy make-believe worlds full of castles, clouds, and ultra sharp, deadly spikes. A very cute, but very dangerous place, so naturally you fight back with the most wondrous of weapons: killer rainbows. There is just something inherently hilarious about the name. Too bad the game isn't as entertaining, except for the opening musical number. Mr. Gold is a sci-fi detective adventure game utterly lacking in interesting sci-fi elements. Being from Toei, it is naturally based on one of their anime movies, which was given some sort of release in the US as "Samurai Gold." As a point of comparsion, we have another, much better adventure game this episode, Jarinko Chie: Bakudan Musume no Shiawase Sagashi from Konami. You probably don't need a lesson from me in distinguishing the works of Toei from those of Konami, but just for fun, let's compare two screenshots. 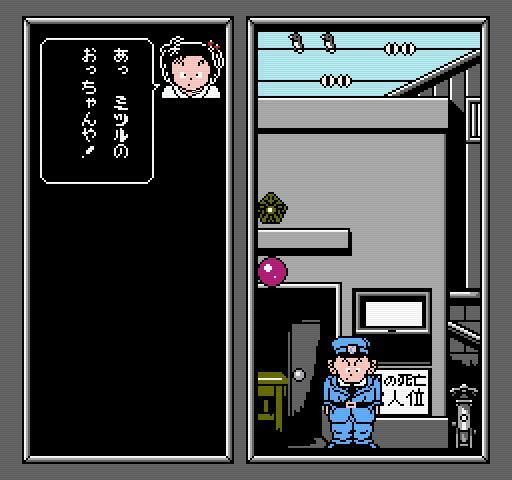 Note the amount of detail put into Jarinko Chie: the attendant's wrinkly uniform, the deep shadows on the door inside the little room, the reflection of the sun on the red light above the door. In the background we see some sort of alley with a brick wall, birds sitting on telephone wires. Every inch of the illustration is used to convey you into the world of the game. Konami even went through the trouble of adding a beveled frame around each box. Mr. Gold, on the other hand, gets by with the minimum amount of effort required to depict Mr. Gold standing in a spaceport. A few quick vertical and horizontal lines delineate a window and a walkway. Gold appears to be staring at a monitor showing a not-too-futuristic cityscape. No attempt is made to give Gold himself any sort of personality. And the fact that the illustration itself is so darned tiny doesn't help, either. Obviously, Konami didn't have to put that much work into a single background, but they did because... they're Konami. This is the boring sidescrolling game I mentioned a few paragraphs ago. A Japan only sequel to Flying Dragon: The Secret Scroll. Sadly, despite Culture Brain's last game, The Magic of Scheherazade being so ahead of its time, Hiryu II is a beat-em-up on par with Hokuto no Ken plus RPG elements. Someone must have been buying these, since Culture Brain continued to release sequels into the Nintendo 64 era. From the infamous Vap and Nintendo developer Pax Softnica, this realistic style baseball game fails on several levels. You'll probably be most frustrated by the terrible controls - even picking a ball up off of the ground is a chore. But the ear-piercing soundtrack will eventually wear you down as well. Why do so many Japanese baseball games feature an horrendous whistle sound in their background music? Is that something done at real baseball games in Japan? Do they have a squad of drum majors marching around the diamond or something? Today's theme is games with weird jumping mechanics. Tower of Druaga isn't exactly Namco's most beloved game in the West. But this console-only prequel manages to be nothing like the other Druaga games, and a really terrible monotonous game in its own right. You control Ki, the princess that Gilgamesh had to rescue in the first game, and you enter Druaga's tower completely unarmed. In place of any sort of weapon, you have a ridiculous jumping mechanic that allows you to jump as high as you want, until you hit the ceiling and go plummeting back to the ground. The tower comprises 100 floors. 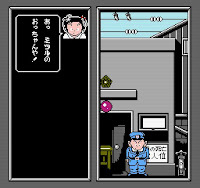 The object is simply to pick up and key and exit each floor before the timer runs out. And finally, we have a varied collection of flawed, non-distinguished, or uninteresting games. 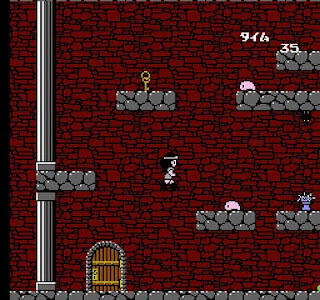 Kid Kool suffers from difficult jumping and easy bosses. 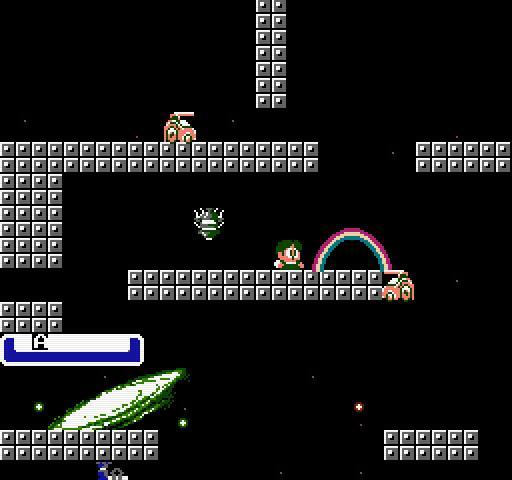 Vic Tokai tries to make a Mario clone; ends up cloning the Japanese Super Mario Bros 2 instead. Aside from generally insidious level design that includes way too many blind jumps, Kid Kool suffers from some seriously weird physics. The developers didn't see fit to give Kool a "run" button. Instead, as Kool begins moving, he transforms from a sluggard who moves like he's waist-deep in mud into Usain Bolt driving a McLaren with a rocket jet mounted on the trunk. The fact that he has the momentum of a runaway locomotive doesn't help much either. His jumps can range from about two body lengths to "all the way accross the screen," and he is just a wee bit difficult to land precisely. Amazingly, he was based on real person: Kakefu Kun was a young TV actor during the mid '80s. I was not able to glean any information on his real life jumping abilities. It doesn't look that radical to me! A nutty looking and impenetrable strategy/puzzle/board game thing from Jaleco. So named because you can set off little bombs to blow up the rails on which you and your opponents travel. I was not able to appraise the radical-ness of the protagonist, however. Nice looking game, but despite the name, it isn't that great. 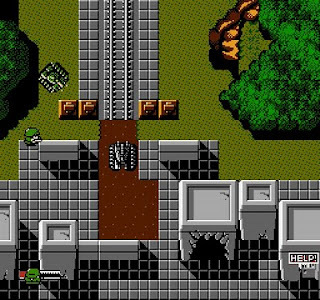 SNK reaches into its vaults for this one: a port of the 1985, pre-Ikari Warrriors game TNK III. I's sort of resembles a cross between the tank sections of Ikari Warriors and Konami's Jackal. Except that its not nearly as good as Jackal. No one bought Best Play Pro Yakyuu for the fancy graphics. 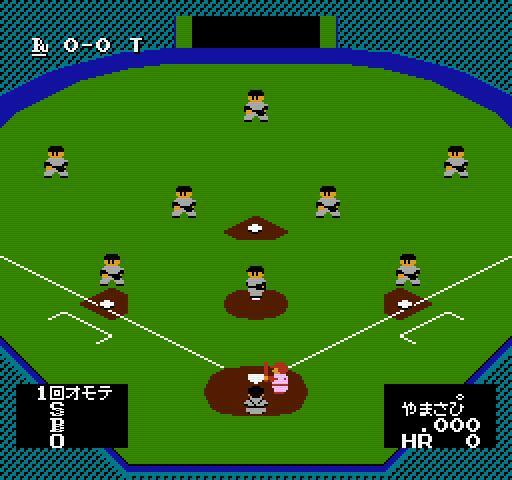 A highly thought of baseball simulation game from ASCII. It focuses heavily on stats and team management, rather than Family Stadium style action. So it's basically a baseball game for geeks. This appeared on the 2005 Famitsu readers' poll we mentioned a while ago, beating about fellow Famicom titles such as Gradius and SMB III. A port of Microcabin's computer adventure game, briefly glimpsed in the adventure game segment of Episode 31. We'll come back to it in more detail when we cover the PC Engine version in a future episode of Chronturbo. Another military strategy game from Namco and Tose, much like Nobunaga's Ambition. Except that instead of taking place during Japan's Sengoku era, it takes placing during China's Three Kingdom's period - which is just like Japan's warring states only it happened in 3rd century China. It appears that Japan not only ripped off their writing system and religion from China, they even copied parts of China's history. Anyway, this game should not be confused with Koei's much more popular Sangokushi series. The top-down run-and-gun parts of Bionic Commando that occur when you run into a truck on the main map. These sections are not very interesting, but do allow you to pick up additional continues. The deathmatch sytle Bean Ball option in Super Dodge Ball. Here, you run around in a free-for-all with no court and no rules, which actually more resembles the dodge ball I played as a kid. 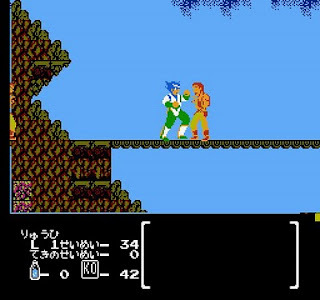 For those of you with a chronological list of Japanese Famicom releases, there are two games not appearing in this episode, since they were released in the US first: Jaleco's Densetsu no Kishi Elrond is simply Wizards and Warriors. And for some reason Data East released Karate Champ for the FDS. Also Nintendo re-released Donkey Kong Jr for the FDS. I haven't really been mentioning this, but Nintendo has slowly been putting out FDS versions of their older titles over the last two years. Very well! See you next time, and don't forget to check out Episode 33 over at Archive! wish i could find an affordable copy of Bionic Commando. sigh. anyway another great episode, and a particularly strong lineup of games. and i'd like to stick up for Quest Of Ki, which is quite an interesting puzzle game once you get used to the controls. gets frustratingly difficult towards the end though. My only quibble is regarding Iron Tank-- I actually think it's a pretty great game! The branching paths, powerups, and slow-paced, deliberate gameplay were pretty deep considering its vintage. While I get the comparison to Jackal, the two games play very differently. Jackal is fast-paced action, Iron Tank is more about inching slowly forward and playing defense to avoid the onslaught of enemies-- its sort of like the difference between Killer Instinct and Virtua Fighter. I actually owned Iron Tank back in the day, so I was forced to play it much more than any sane person would, and perhaps you just need to give it more time to appreciate it? A highly underrated game IMO. Lynxara - That sounds like a pretty convincing, well reasoned explanation to me. It's interesting - the late 60s is also about the time Japanese popular music began to come into its own, after a decade of imitating Western pop & rock. Though you seem to have a bit of a fascination with robots yourself - what's your excuse? Oh, and nice tie-in to the post's title in mentioning The Thing. SD- You know, back when we were kids we sure put up with a lot in video games that we wouldn't as adults. Even boring games got played to death, because we couldn't just go out a buy a new game whenever we wanted. As an adult, I find myself being dismissive of NES games that don't make a good impression in the first 10 minutes. It's quite possible more time with Ki and Iron Tank would lead me to enjoy them; maybe I'm just an overly aggressive player and can only enjoy games where I kill everything? I didn't care for the old Resident Evil games either. Are copies of the BC cart expensive? I wasn't aware that was hard to find nowadays? well, relative to most other Famicom carts its pricey - about $40-50. NES cart is considerably cheaper! Yeah, this is the reason why I hate Capcom for a) not packing the Original Bionic Commando and/or Rearmed with the 3D Remake of Bionic Commando and b) not throwing it on the Wii Virtual Console...at least afaik. Though, Rearmed is available on Steam, I think I could try that out for once. Being reminded there's a pretty good anime movie for "Chie the Brat" I could recommend anyone to check out. That's all for this comment! To answer your question regarding the annoying whistle noise in Japanese baseball games -- they actually DO have those at real Japanese baseball games (kinda). The ouendan (http://en.wikipedia.org/wiki/%C5%8Cendan) is an inextricable part of Japanese baseball at every level of the game, and they often have elaborate cheers featuring horns and taiko drums. The whistling is the NES straining its heart out trying to replicate that feel. I checked out a couple ouendan videos online, and ... Wow! It's really annoying. They seem to quite fond of horrendous noisemaker sounds. 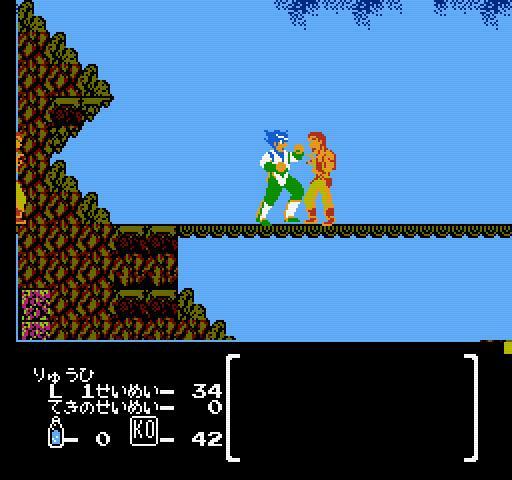 Elrond actually has some weird differences from Wizards & Warriors. Instead of three lives you get one life per continue but no "maximum" health. You also get more health per life. The forest levels, if I remember right, are swapped or something, and the order of the bosses has changed too. Did you know that you can shorten your long urls with AdFly and get money for every click on your short urls.